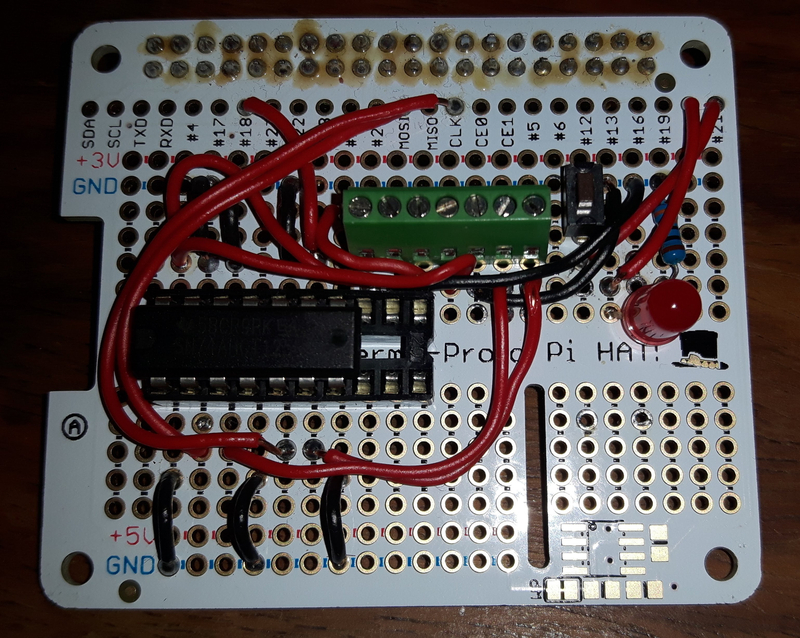 I decided to make use of an AdaFruit Perma-Proto Pi Hat I had lying around, as this meant the associated electronics I would require for this build could be easily added and removed from the Raspberry Pi for future projects. I also decide that I would build my Hat so that it could be used for both portable NeoPixel and DotStar projects. 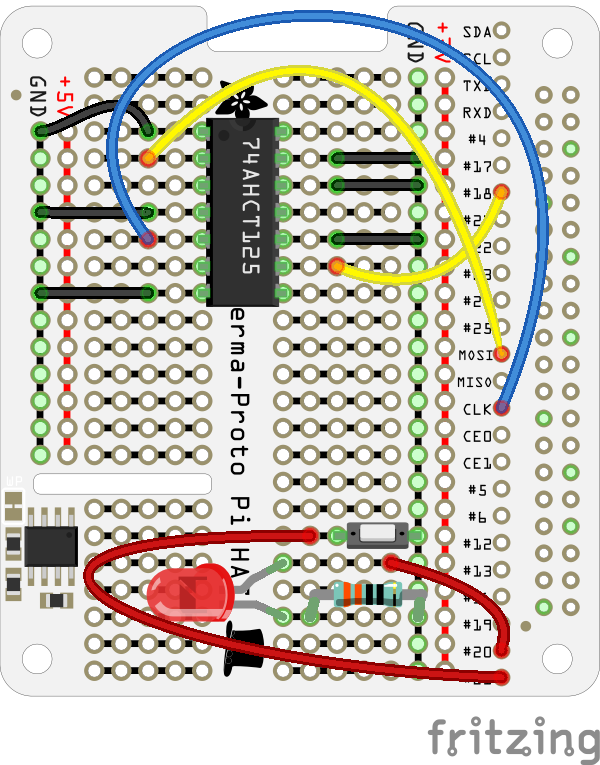 Here is a Fritzing diagram of the completed Perma-Proto Hat and connection to our portable USB power pack and NeoPixel strip. First of all we need to get our Raspberry Pi software up and running. As this is going to be run headless there is no point using the full Raspbian operating system, so head over here and grab yourself the latest version of Raspbian Lite. I always like to change the hostname of my Raspberry Pi projects as this makes it easier to connect to it over WiFi without having to discover the IP address of your Pi. Changing the password will get rid of the nag screen when you log in and is really a sensible thing to do! From the menu which opens, select option 1 “Change user password” and enter your password twice. Back on the raspi-config menu, select option 2 “Network options” and from the next menu select option N1 “Hostname”. Pay attention to the restrictions for your new hostname and enter your chosen name. I am going to call this one “pixelpi”. 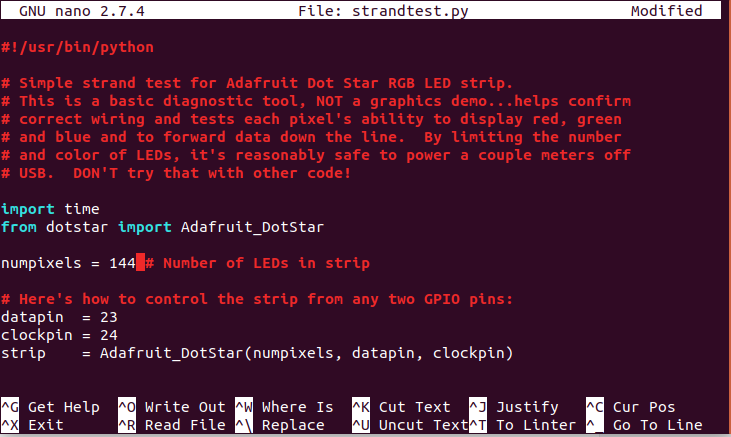 We now need to enable the SPI interface so that we can use DotStar LED strips with our Pi. Select option 5 “Interfacing options” from the menu and from the next menu select option P4 “SPI”, answering “Yes” to enable it. Press tab twice to highlight the “Finish” option and press “Enter”. Answer “Yes” to reboot your Pi now. This might take some time, so go make a cup of tea! We should now have all the software we need for our LEDs! Before we begin adding any components to the Perma-Proto board, solder the female GPIO header block provided to the underside of the board. This will allow us to attach and detach the Hat easily from our Pi. As we will be running our Raspberry headless, we need a way to safely shut it down once we have got it all running. For that we are going to wire a tactile button, LED and resistor to our Perma-Proto Pi Hat and the write a short Python program which will initiate a shutdown of the Raspberry Pi when this button is held for three seconds. Finally we will ensure that this Python program starts as soon as the Raspberry Pi is switched on. I then soldered these onto the Perma-Proto Hat as shown below. I used solid-core copper cable to connect the LED to GPIO 20 and the tactile button to GPIO 21. Feed the components through the top of the Hat and solder them from the underneath, snipping any excess cable or wire from the resistor, LED and cable with side-snips once the solder joint is cold. Our program will make use of the GPIO Zero library to wait until we press and hold the button for three seconds. After we hold the button for three seconds the LED will flash on and off three times and then initial a safe shutdown sequence of our Pi. You should see a message saying that the service is started. If not go back and check everything and try again! If all is well, press and hold your button for three seconds and you should see your LED flash three times and then your Pi will shutdown. Now we have that all working we can move onto the next stage! Both the NeoPixels and DotStars are rated as 5 V devices, yet the Raspberry Pi GPIO pins run on a 3.3 V logic. 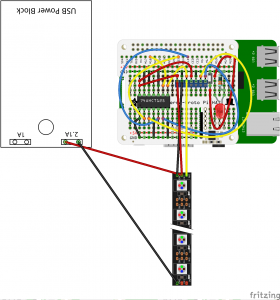 When powering your DotStar and NeoPixel devices from mains you can often get away with running them directly from the Raspberry Pi’s 3.3 V GPIO pins, however as we are going to be running the LEDs from a portable battery pack I have found it is better and more reliable to make use of a voltage level-shifter. This small chip will take an input at one voltage and step it up or down to match the voltage with which you power the chip. We will be making use of the AdaFruit 74AHCT125 – Quad Level-Shifter (3V to 5V) for this project. First we solder the IC socket to the Perma-Proto board as shown below. Note the IC socket linked above has 16 pins yet we only need 14 for our 74AHCT125. This is fine, we just need to ensure we insert the chip the correct way once we have finished soldering; pay attention to half-moon indent on the top of the chip! 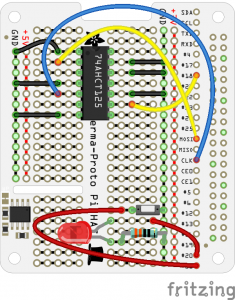 Now you need to connect the following lines from your IC socket to the two GND lines of your Perma-Proto Hat. Use side snips to trim any excess cable from the underside when finished. 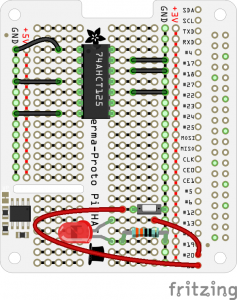 Now you need to connect the three data lines from your Pi GPIO pins into your IC socket. 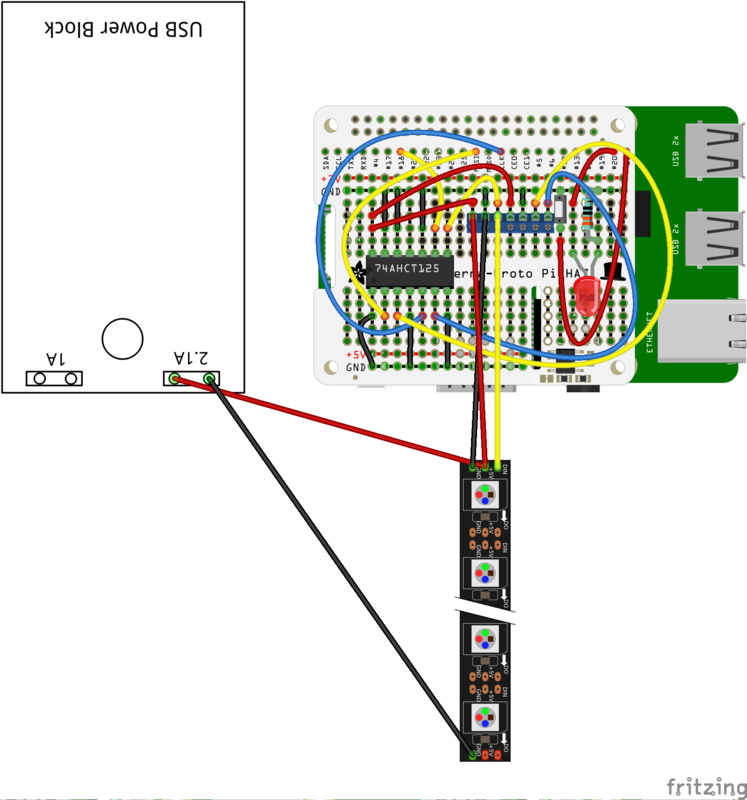 The NeoPixels use GPIO 18 by default and the DotStars use the MOSI and CLK pins. Each data line will need it’s logic stepping up from 3.3 V to 5 V. I have shown the routes of the cables to try and be as clear on the diagram as possible. You will want to route your cables in the neatest way you can around your hat! Now we have our GPIO data lines form the Pi going into the chip we need to connect them back to our NeoPixel or DotStar strip. To make this a reusable setup we are going to make use of a terminal block to enable us to easily attach and detach our NeoPixel and DotStar LED strips to our Hat. 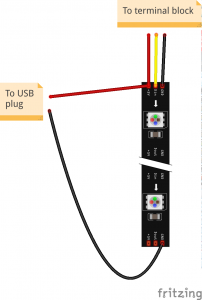 You may find that you need to route your cables around a little differently than the diagram to get everything to fit. 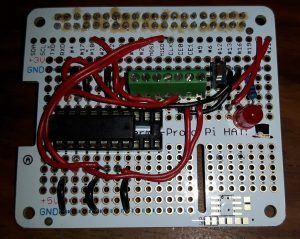 Here is a picture of my finished Hat, ready to be added to my Pi and have the LED strip connected. You can now glue your DIY USB socket together. I used plenty of hot-glue and wrapped it in electrical tape to be sure! 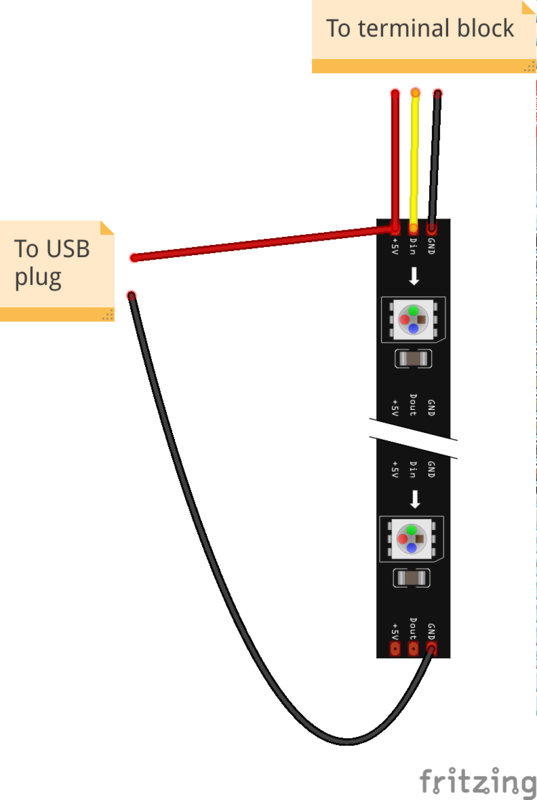 Now attach the cables to the either end of your NeoPixel or DotStar LED strip as shown below. 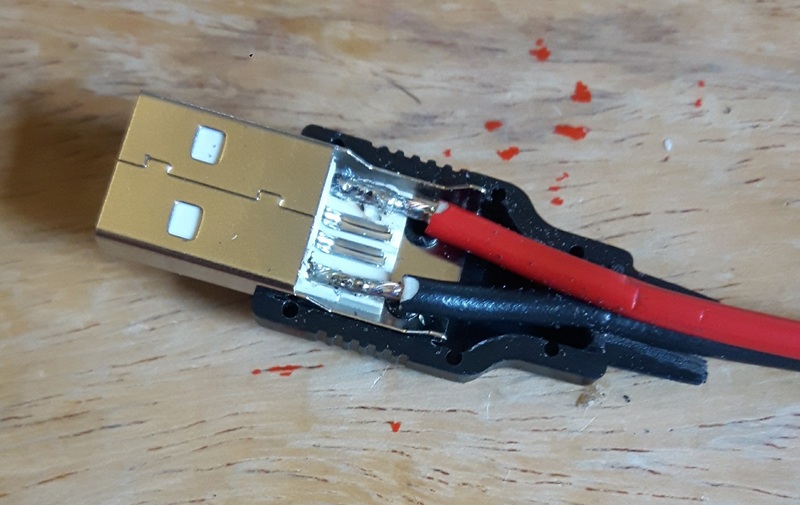 you may need to desolder the supplied cables from each end of your LED strip to do this! 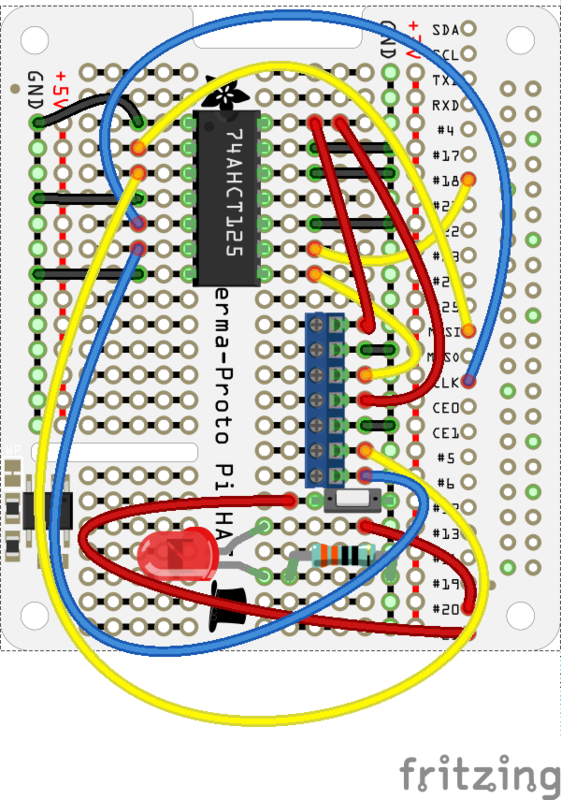 Note that the red VCC line goes into the input end of the strip and the black GND line comes out of the output end. On your input end of your LED strip also solder cables to wire back to your terminal block on your Hat. You will need a VCC and GND line for both types of LED strip. The NeoPixel only requires a single data line, whilst the DotStar requires two. Now you can connect your LED strip to your terminal block on your hat and power it up with your USB battery pack. I have a nice 10140 MAh battery pack with a 2 A and 1 A output. I am using the 2 A output for the LED strips and the 1 A output to power the Pi. New that we have finished our electronics and connected our LED strip to our new hat we need to test them! 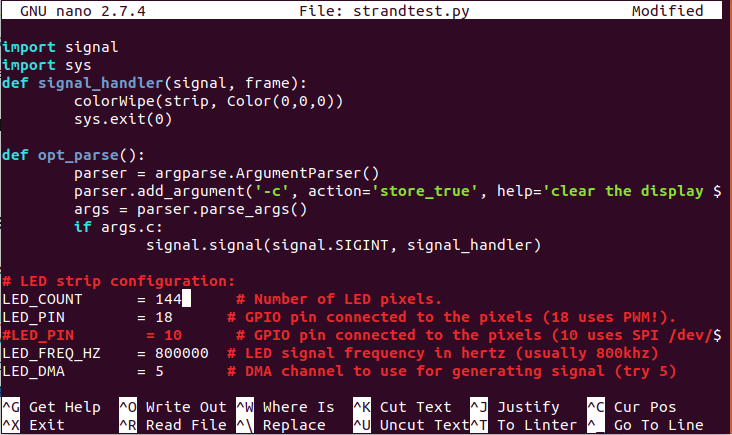 With your LED strip powered from the 2 A line of your USB battery block and your Pi powered from the 1 A output, SSH into your Pi to begin testing the software libraries we downloaded right at the start. You may need a different order depending upon your strip. You are now ready to create your own DotStar python creations! Use the systemd definition example for the shutdown button to make your python program run at boot up. You can now create your own NeoPixel python creation! Use the systemd definition example for the shutdown button to make your python program run at boot up. Pingback: NeoPixels, DotStars and Raspberry Pi – Decorating a Festival Trolley with LEDs #piday #raspberrypi @Raspberry_Pi « Adafruit Industries – Makers, hackers, artists, designers and engineers!